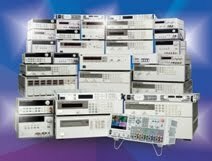 Eighteen months ago, in September of 2013, Keysight (we were Agilent at the time) introduced a new high-power series of power supplies: the N8900 series of 5 kW, 10 kW, and 15 kW autoranging DC power supplies. I posted about those here. Recently, our environmental lab was doing some testing on one of the 15 kW models that required them to use a low-noise load on the output. They have electronic loads that they can connect to the output to dissipate this level of power, but to be sure they were getting the lowest noise possible, they wanted to use resistors to load the output instead of the electronic loads. Since I was amused by the size of the resistors, I thought I’d capture the moment and share a picture with you. The picture shows one of our R&D engineers in our environmental lab adjusting the output voltage of a 15 kW N8900 series power supply. Notice that these power supplies pack a lot of power (15 kW) in their small 3 U high package (the white box under the fan). The four big green things on the rack are resistors. The two on the top rack are each rated for 15 kW while the two on the lower rack are each rated for 20 kW. So that’s a total of 70 kW of resistive power! Clearly, these are not your father’s ¼ W resistors! Even with 70 kW of power dissipation capability, and “only” 15 kW available from our power supply, a big fan was needed to keep the resistors cool…..or perhaps I should say “less hot” since they still get very hot. Of course, with an extra 15 kW of power being dissipated in the room, the room temperature was going up. But that was a good thing since we are still experiencing cold weather here in New Jersey despite the fact that spring started ten days ago. So the extra heat felt good! Before we came out with the N8900 series of high-power supplies, Matt had posted about some things around his desk that included a 2500 W resistor (click here for his post). At that time, that was a high-power resistor. But now with these 15 kW supplies, you can see we had to go much bigger! And given that these supplies can be paralleled to 100 kW or more….well….I look forward to seeing what our R&D group and environment lab engineers come up with to do resistive load testing on those. Submarine-sized resistors, perhaps? We’ll see…. Students, I highly recommend you to get acquainted with this information. Have a great day!